Beatrice Mennonite Church (Mennonite Church USA), formerly Second Mennonite Church, Beatrice, Nebraska, was organized as an independent congregation in 1926 with 75 charter members. The Mennonites who settled in and near Beatrice originally worshiped at different places but constituted one congregation under one elder. Those residing in and near the city at first worshiped in a rented hall. In 1901 a church was built in Beatrice and Sunday school was introduced. The Christian Endeavor society was organized in 1903. Sam D. Ruth conducted a mission Sunday school on Sunday afternoon for over 20 years. In 1926 the group decided to organize as an independent congregation. By 1953 the membership totaled 174. H. T. Reimer and Jacob Wiebe, elected as lay ministers previous to the organization, served the congregation occasionally after 1926. M. M. Horsch, 1927-1939, was elected as the first full-time minister, followed by Reynold Weinbrenner, 1939-1942, H. A. Claassen, 1943, E. Koontz, 1944-1948, and E. R. Friesen, 1948- . The church was enlarged in 1929 and a full basement added in 1950. 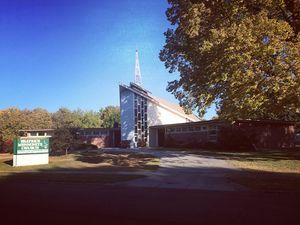 The present building was built in 1960 and designated "The Church of the Sermon on the Mount." Music was always important to the church and it had an active choir. Fellowship groups for young people were started and continued in 2019 with First Mennonite Church. The men of both Mennonite churches established a Brotherhood which served both congregational members and the community in times of misfortune or disaster. The women of the church organized a Women’s Mission Society which has supported foreign missions and projects since the 1920s. From 1974-2001, Beatrice Mennonite and First Mennonite founded and jointly operated one of the first day cares in Beatrice. The day care became a placement option for numerous Mennonite Voluntary Service workers. Gingerich, Melvin, Cornelius Krahn and Brett Klingenberg. "Beatrice Mennonite Church (Beatrice, Nebraska, USA)." Global Anabaptist Mennonite Encyclopedia Online. March 2019. Web. 25 Apr 2019. http://gameo.org/index.php?title=Beatrice_Mennonite_Church_(Beatrice,_Nebraska,_USA)&oldid=163522. Gingerich, Melvin, Cornelius Krahn and Brett Klingenberg. (March 2019). Beatrice Mennonite Church (Beatrice, Nebraska, USA). Global Anabaptist Mennonite Encyclopedia Online. Retrieved 25 April 2019, from http://gameo.org/index.php?title=Beatrice_Mennonite_Church_(Beatrice,_Nebraska,_USA)&oldid=163522. Adapted by permission of Herald Press, Harrisonburg, Virginia, from Mennonite Encyclopedia, Vol. 1, p. 257. All rights reserved. This page was last modified on 10 March 2019, at 10:34.